Color: Carpenter bees have abdomens that are black and shiny, not hairy; males are orange and black in color and females are completely black. Characteristics: Solitary bees that resemble bumble bees. They bore holes in wood to create nesting areas. Size: A large type of bee, these pests range in size from ½ to 1 ½ inches in length. Carpenter bees are not using the wood in and around your home for a food source, like termites, but rather as a nesting area. They bore circular holes in it to lay their eggs and will also use those holes to nest in over the winter months. They prefer unpainted, weathered softwoods; these areas are usually found on decks, porches and sheds. Carpenter bee breeding pairs will often come back to the same area year after year to make their nest; this also increases the amount of damage that they can do to your home. What kind of a threat do carpenter bees pose? Female carpenter bees do have stingers, but rarely sting people unless they are directly handled or threatened. Male carpenter bees are aggressive, but do not have a stinger; they will fly around your head and buzz loudly in an effort to intimidate you. The holes that the carpenter bees create in the wood of your home can be enough to weaken the structure. Woodpeckers, attracted to carpenter bee larvae, may also cause damage to the structure. 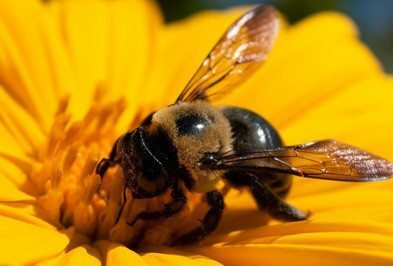 Controlling carpenter bees can be a difficult task; there is the possibility of being stung and having an allergic reaction. Also the fact that consecutive generations come back to the same area to nest can make completely getting rid of them tough. Contacting the professionals at Holder’s Pest Solutions is the best way to rid your home or business of carpenter bees. Contact Holder’s today to find out more information on how we can help to eliminate carpenter bees from your property.